This Reserve is one of the largest National Parks in South Africa and is established on an extinct volcano. The big 5 as well as various other wild life, bird and plant species can be found here and can almost always be seen on one day. The wild life is abundant and the excitement of seeing these animals in their natural habitat in these beautiful surroundings is addictive! 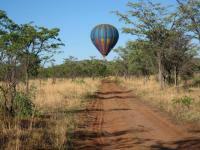 Also offered are balloon safaris, where you are taken up in the air with a hot air balloon from where you can enjoy splendid sceneries whilst sipping sparkling wine. The landscape consists of varied panoramas and colourful hues which lend itself to beautiful photographic opportunities. Thabayadiotso - the beautiful mountain, and the Pilanesberg Mountain reflect in the Mankwe Dam, which is the park's largest central lake. Below is ne of our exciting tours we can offer you. Please contact us so that we can discuss with you, or tailor make the tour to suit your requirements. We depart from Johannesburg at 5h00 in the morning and travel overland to Pilanesberg National Park to enter the Park at 7h00. The journey takes +- 2 hours. You will be travelling in a luxury air-conditioned vehicle. The volcano crater in which the park is situated erupted 1300 million years ago. Pilanesberg was originally owned by 3 of the local tribes. Many of the Stone Age and Iron Age sites around the reserve show proof of the presence of man. You are bound to see most of the Big Five and a lot of the over 7000 animals in the Park. We will make a stop at the Pilanesberg Centre which is located at the heart of the Park close to Mankwe Dam, one of the parks best viewing areas. The centre offers a range of facilities including well-maintained toilets, a gift shop where cold drinks, snacks and basic safari supplies and curios are also available and a restaurant area serving an array of hot and cold food, tea, coffee and alcoholic beverages. Lunch will be for your own account. We will also make stops at the photographic and bird watching hides along the way. This allows you to get out of the vehicle and get up close and personal with nature in a very safe environment. We will leave the Park at about 16h00 to return to your accommodation or destination in Johannesburg. The above price includes transfers and all entrance fees. It excludes all meals and refreshments. Water will be provided on the minibus.